Despite the retail narrative telling of closing retail stores and declining customer spend, the retail industry is succeeding in many ways thanks to new digital channels and an increase in consumer confidence. To help you navigate the fast-paced and constantly-evolving retail landscape, find out what’s really going on in our Shopper-First Retailing report. Use this latest Salesforce survey as your roadmap to achieving success by improving your relationship with customers and keeping them engaged both in-store and online. The Shopper-First Retailing report shares insights that will have a lasting impact on your retail business. Information from the Salesforce Commerce Cloud and the Salesforce Service Cloud provide data from half a billion shoppers worldwide, which will help you find opportunities for growth by enhancing your relationship with customers. Survey data from 6,000 people across 6 countries—the US, Canada, the UK, France, Germany and Australia—tells you what shoppers are looking for and how they’re purchasing goods and services today. You’ll also see the results of our mystery shopping visits to 70 physical retail stores across London, New York and San Francisco: these in-person assessments graded the existence and importance of new ways to connect with your customers through activities like mobile features and loyalty programs. Delve into the Shopper-First Retailing report, you’ll learn about the three shopper-first mandates that apply to your retail business. Our first mandate, “Make it fresh,” shows you the importance of speed and freshness as part of the customer experience: 69% of shoppers expect to find new merchandise when they visit a store. The classic 80-20 rule is currently holding true, with the top 20% of products driving 80% of sales. So which retailers are keeping up with expectations, and how are they doing it? You’ll learn the strategies today’s top retailers are using to keep the shopping experience consistently fresh and up to date—even though 28% of shoppers start their hunt for a product on marketplaces. You’ll also find out how these same retailers engage shoppers to repeat purchase with perks like customisation, limited editions and collaborations with other brands and notable influencers. Our second mandate, “Be where I am,” is all about the importance of evolving the in-store experience, using digital channels as part of the retail store or site experience, and playing to marketplaces’ strengths and weaknesses. 46% of shoppers prefer to buy in a physical store, and 71% of them are using mobile in-store to enhance their shopping experience. However, we visited 70 stores and found the average mobile score was only 1.74 out of 5. This is an opportunity for you to engage customers on their own terms. You’ll discover what percentage of shoppers actually begin their search for a product digitally and how to convert that search into a retail store purchase. We discuss tools that will strengthen your relationship with customers through values-driven connections such as sharing information about successful loyalty programs and enhanced personalisation of the shopping experience. Our survey also tells you why some shoppers choose the marketplace over brand or retail—even when the price is the same—and how you can encourage these customers to purchase in store the next time they shop. Our third shopper-first mandate is “Give it meaning.” 46% of shoppers surveyed feel that retailers “don’t truly know them.” The Shopper-First Retailing report helps you give meaning to the shopping experience. Resonating with customer values or implementing a loyalty program to improve your bond can encourage and increase repeat purchases. Maybe your company is ready to make strides with personalisation and AI. You’ll find out how leading brands, retailers and marketplaces help shoppers feel emotionally connected and spend in line with their personal values. Also included in the Shopper-First Retailing report are four fundamental retail truths that should underpin your shopper-first strategies. Discover how to lead with mobile to ensure a smooth in-store browsing and checkout experience and how to empower the store through product customisation and more, as well as how to infuse intelligence into the shopping experience so that buyers feel connected with your company when visiting a retail store. We also outline how connecting seemingly disparate experiences can help customers to enjoy a more personalised service, no matter which company department they interact with. The data in our Shopper-First Retailing report provides you with the in-depth survey results you need to engage your customers on all levels. Use it as a roadmap to determine which strategies you need to focus on—and how to reach new levels of retail success. 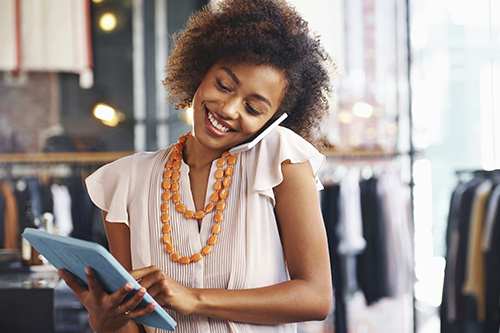 With shoppers choosing retailers over marketplaces for customer service and unique in-store experiences, this is your opportunity to use technologically powered tools for even stronger retail store growth.